The T-12 was the first medium tank design, which did not work; it evolved into the T-24 which was also seen as not promising. Undaunted, the designers at Factory No. 174 in Leningrad (the old Putilov factory) designed a new medium tank in 1933 which became the T-28. Originally designed to carry a very-short barreled 76.2mm howitzer and three 7.62mm DT machine guns, it evolved to later carry the longer L-10 gun and another machine gun with optional mounting either in the rear of the turret or on an AA mount over the commander’s hatch. The armament, as with all pre-war medium designs, was “multilayered” with two separate machine gun turrets on the front quadrants and a main turret elevated above them. The machine gun in this turret was not coaxial but fired from a separate ball mount to the right of the main gun. Power came from a derated M-17 aircraft engine and with 500 HP the 25.2 metric ton tank could roll along at 40 kph. 517 of these tanks were built between 1933 and 1939, with each production year slightly different in design from the previous one. Unfortunately, the armor was no more than 30mm thick and as a result once engaged in combat in the “Winter War” with Finland its weaknesses became obvious. An upgrade program did see most tanks (more than 300 of the 517) fitted with the better L-10 gun, but few of the tanks received the applique armor upgrade (s Ehkranami or T-28Eh) before the war broke out. A handful did survive the war and were scrapped in 1947. 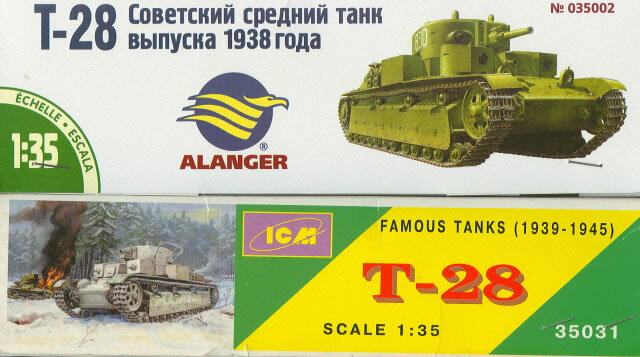 Approximately 15 years ago Alan of Russia came out with the first plastic kit of a T-28, which was (like many Alan kits) crude and not very accurate. Roughly two years later ICM from Ukraine released their version along with an IT-28 bridge launcher variant; while the IT-28 was lacking (as nobody had the plans for the vehicle and ICM only built what they could see in photos) the T-28 kit was not bad. It was accurate within limits in scale, had some nice petite details, and a partial interior. But it have some features from different years of the tank’s production. The best source for sorting this out is “Frontovaya Illyustratsiya” issue No. 4-2000, “Mnogobashennye Tanki RKKA - T-28, T-29" (RKK T-28 and T-28 Multi-turreted Tanks) by Maksim Kolomiyets. He has very good drawings in this book of the different versions (and even though the text is all Cyrillic the illustrations are tagged in English). Another good source is “Steel Fortress: The Russian T-28 Medium Tank” by Mikhail Baryatinskiy and Jim Kinnear from Barbarossa Books in the UK. The reason I mention this is that the Alanger kit, a relatively recent release, is a cleaned-up version of the ICM kit and not the Alan one as has been mentioned in several blogs. This is good, as of the two kits this one was by far the better. Also, I have never found an ICM kit which did not require at least two trips to the sink and a heavy cleaning in dishwashing detergent to clean the moldings from mold release; the Alanger pressings are clean and crisp. There does seem to be some minor tweaking of the molds, but as with the earlier kit there are some mixed features. The model is missing the steel wheels on its fourth and fifth bogies, which was only common to early models of the tank. While it has the late-model engine air exhaust grille covers over the fan, it has 1934-1935 boxes for the smoke generator systems. It does have the late-model drivers as well as the cast blunt star on the turret roof. As it is based on the original ICM kit, it comes with both the KT-28 and L-10 guns and mounts, but given the majority of features present and the actual history of the vehicle should only be built with the long-barreled L-10. Also note that the tank was only authorized an issue of four machine guns (some did later carry a spare) so you may wish to either mount the rear one or the AA gun, but not both. Overall, it is very close to what it claims to be, but is still missing some key parts such as the tarpaulin bin on the left side of the hull. You can either purchase a set of etched parts or make one from thin strip, which is pretty much what the Soviets did. It is also missing the radiators in the engine compartment (on either side of the engine, with a massive fan at the rear for air flow). But getting good info on the engine bay will be very difficult. The steel wheels are the hardest thing to replace, but I have found US 1950-1960 return rollers from M48s and M60s are the right size and with some care can be altered to fit on the model. The suspension is somewhat spare in detail, but once the skirts are in place only the bogies and wheels are visible. Most of the rest of the kit is pretty straightforward. Note that painting directions for the interior are completely lacking so if you do want to do it up you are on your own. But the floors are grey, the rest of the surfaces are white, and the guns and fittings are either black or olive drab, so you can at least get close. Oddly the kit comes with two finishing schemes and a set of decals for “none of the above!” They are for the box art version, finished in 4BO green. The others are a whitewashed tank, Karelian Isthmus, winter 1939-1940 and a three-color camouflaged tank from the 1st Tank Division, Northwest Front, August 1940. Overall, while it would be nice to see a new-mold kit of the T-28 this one is not bad with a bit of work, and at least it provides a good basis to start with when doing up a pre-war Soviet tank.